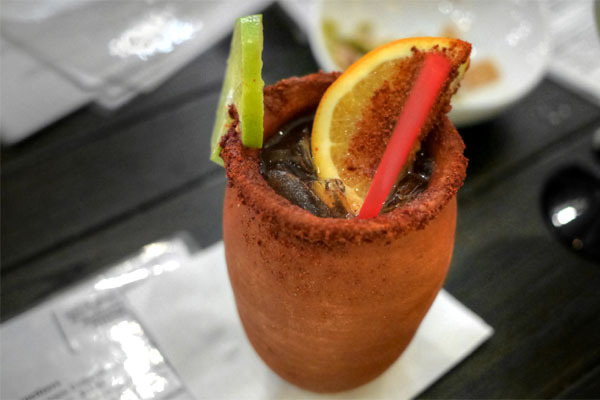 Jaime Martin del Campo and Ramiro Arvizu opened La Casita Mexicana in 1998, their seminal Bell eatery that helped refocus Mexican cookery in Southern California. After 15 long years, the duo finally expanded their culinary offerings last year with the debut of Flautas, a quick service, flautas-focused joint inside the Baldwin Hills Crenshaw mall food court. I visited the spot back in January and enjoyed my meal there, so a dinner at its sister restaurant was a no-brainer. 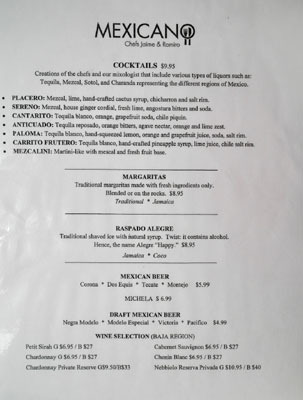 Mexicano opened at the start of February as a much more ambitious sort of place. Things are cozy, colorful inside, befitting the food and what they're going for here. 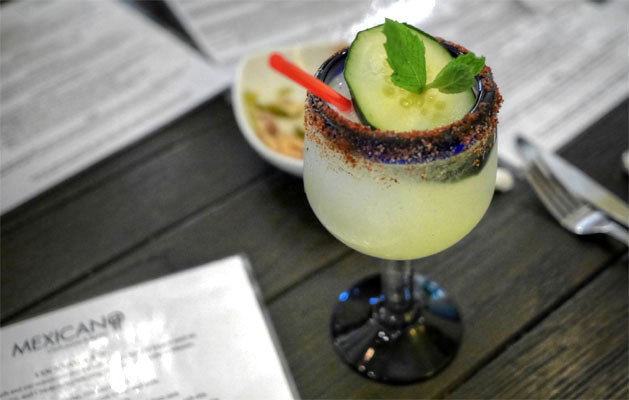 There's a brighter, brasher bar area out front (check out that mural depicting key figures in Mexican history and culture), a more sedate dining room in the rear, as well as outdoor seating to boot. 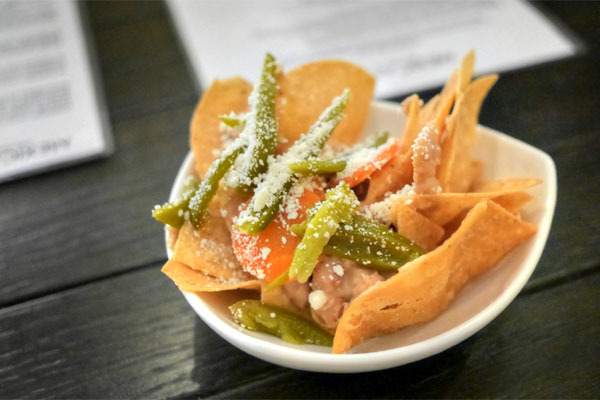 Divvied up into a number of small sections, Mexicano's menu spans multiple regions, and features La Casita classics in addition to some newer plates. 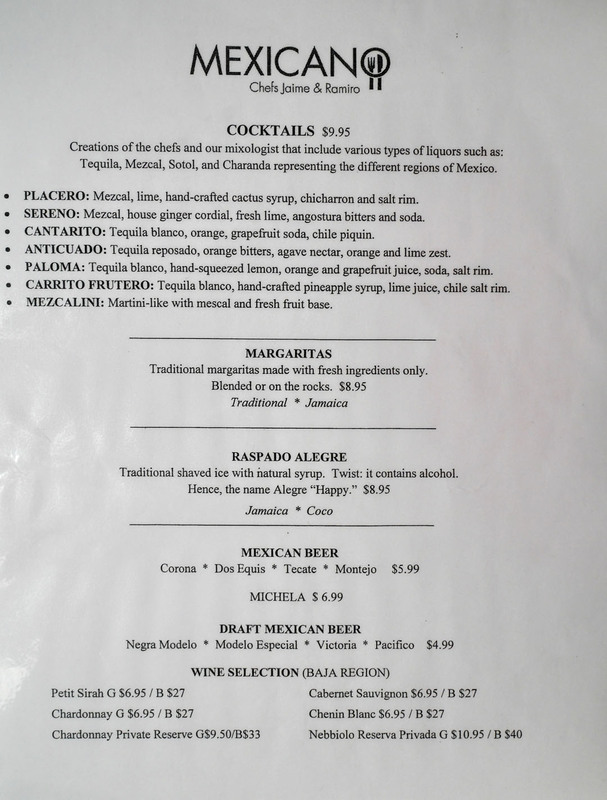 To drink (the restaurant got its liquor license in March), you get an expectedly tequila- and mezcal-heavy cocktail list (the most reasonably-priced I'd encountered in a while), Baja wines, and a handful of non-craft Mexican beers. An interesting wrinkle is the presence of raspados, or shave ice, a tribute to the paleta cart once operated by Arvizu's grandmother (in fact, the entire bar is named "La Esperanza" after the cart). Click for larger versions. In lieu of the ubiquitous pairing of chips & salsa, La Casita Mexicana provided chips & mole to the table. 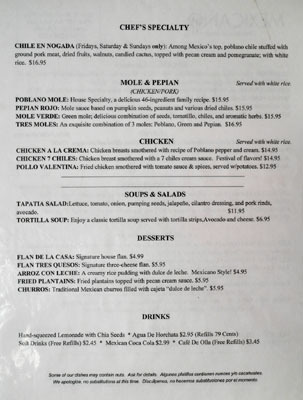 However, mole may be a bit much for the typical diner here, so instead, those totopos arrive accompanied by beans, pickles, and cotija. 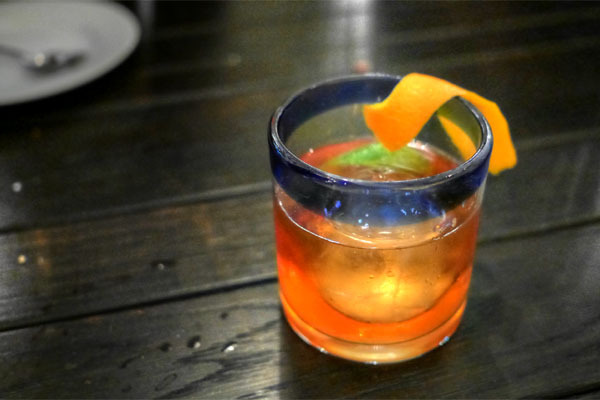 Given the place's newly-installed liquor license, we had to give the cocktails a whirl, starting with this concoction, a blend of sweet, smoky, spicy, and fruity nuances, backed by the agave notes of the tequila. 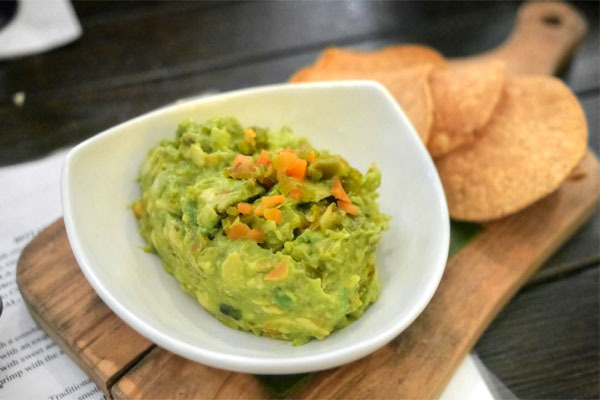 The guacamole, unsurprisingly, was top notch, a lush, creamy presentation with a great overarching tanginess and just a whisper of tequila heft underpinning the whole dish. Great tostadas on the side, too. This next cocktail was one of the boozier ones of the evening, with the sweet, fruity notes in the drink balanced by a strong backbone of tequila and the spiciness of the salt rim. 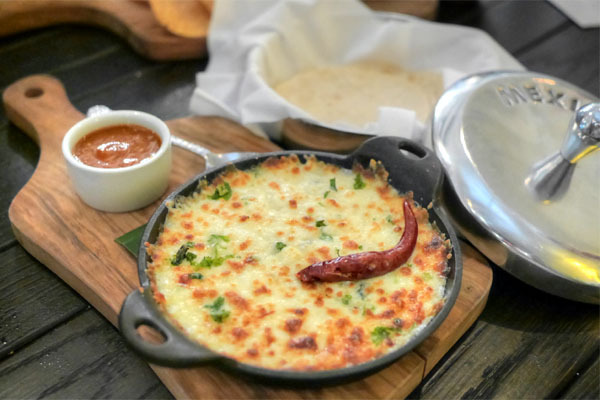 Mexicano's queso fundido was certainly one of the best I've had, a super smooth, delightfully cheesy example perfectly grounded by the potency of the tequila. Even better when taken with the warm housemade tortillas and a dash of the included salsa. 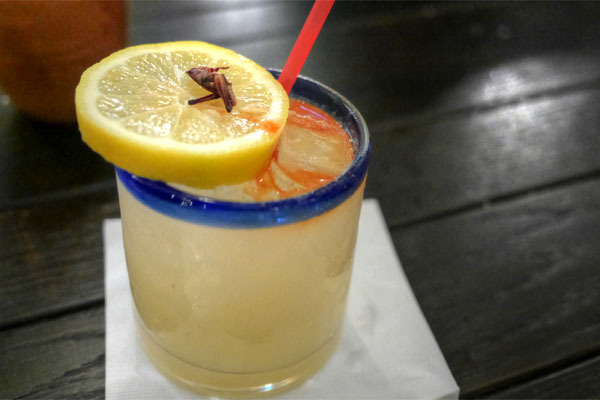 The Paloma seems to be becoming more and more popular, as I'd encountered variations of it recently at the likes of Scopa, Tacoteca, and El Condor. 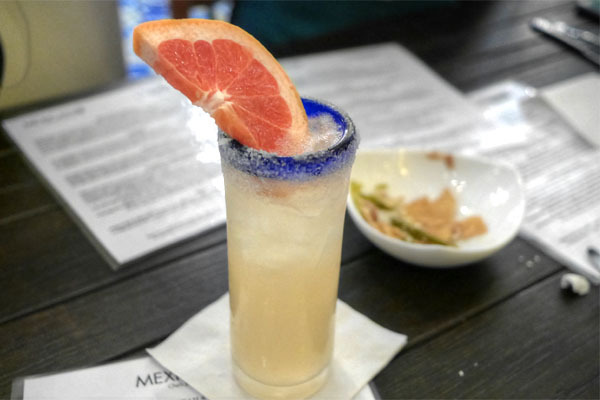 This was certainly the lowest-priced incarnation, and also the most apparent in terms of sweetness, with the fruity citrus really coming to the fore, tempered by the tequila and salt. Very easy-drinking. Mexicano's ceviche was also on point: light, bright, and properly zippy, with the fish fresh and satisfyingly textured. 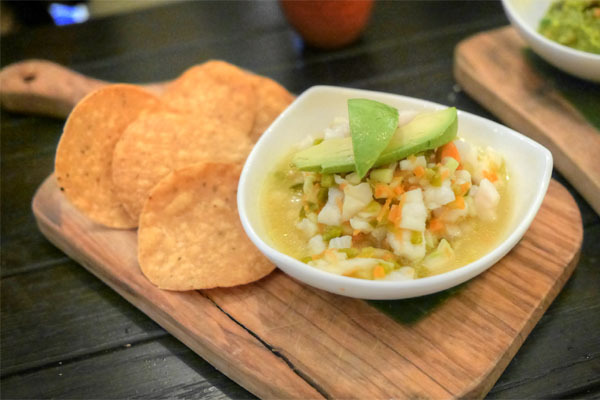 In fact, I wouldn't mind seeing more renditions of ceviche here. 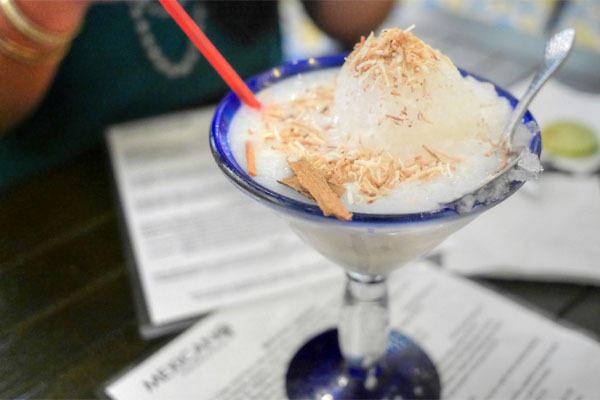 We felt compelled to try a raspado, and the coconut version arrived sweet and fragrant, with some nice toasted bits and an undercurrent of booziness. I wanted a finer shave on the actual ice, though. 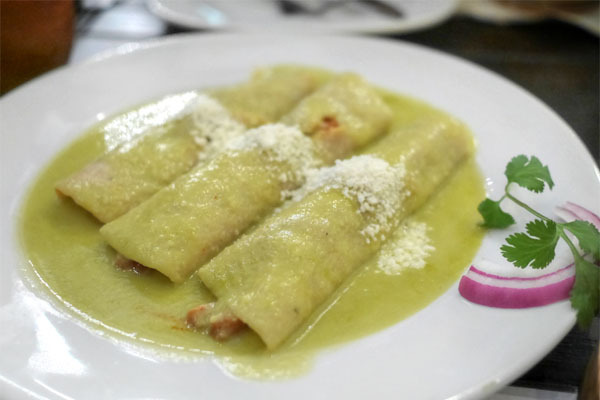 I enjoyed the enchiladas, which did a nice job showing off the inherent brine of the shrimp. Great texture on the tortillas as well, but the key here was that pipián verde, which imparted a fantastic offsetting tanginess to the dish. 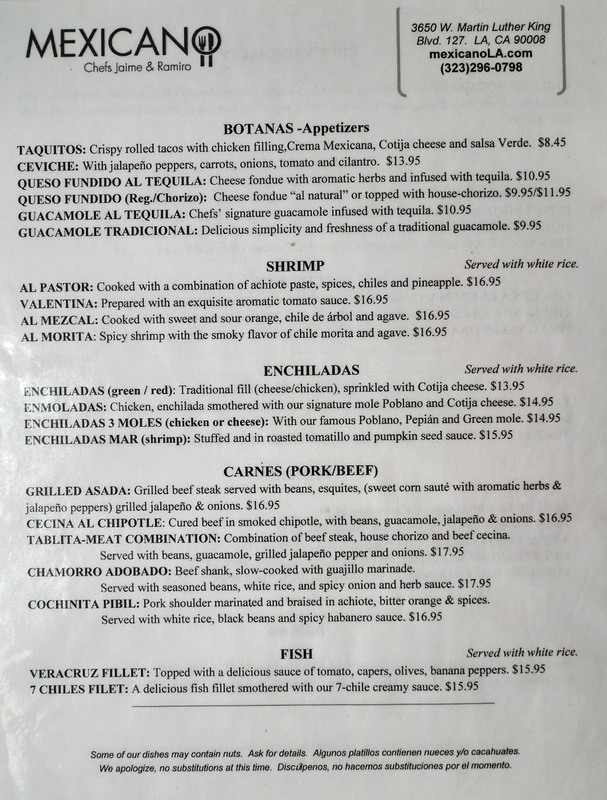 If you recall, I wasn't too enamored with the cochinita pibil over at Flautas. I'm happy to report that Mexicano's was much more gratifying, with the deeply-spiced, tender nuggets of pork here accented by a tangy acidity. 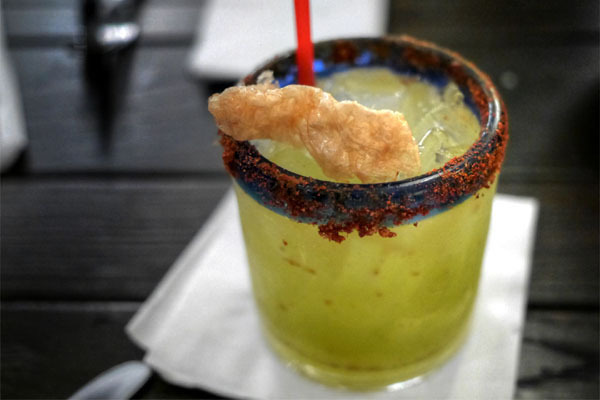 Moving on to the mezcal cocktails now, this one did a great job showing off the spirit, its smoky character on display, yet moderated by the tartness of lime while chicharrón added a savory element to the mix. 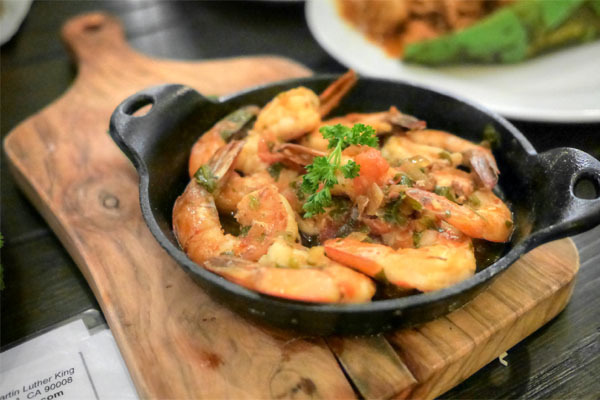 Shrimp were a touch overdone, but still delicious, their salinity deftly enhanced by the headiness of the smoky chipotle and agave here. 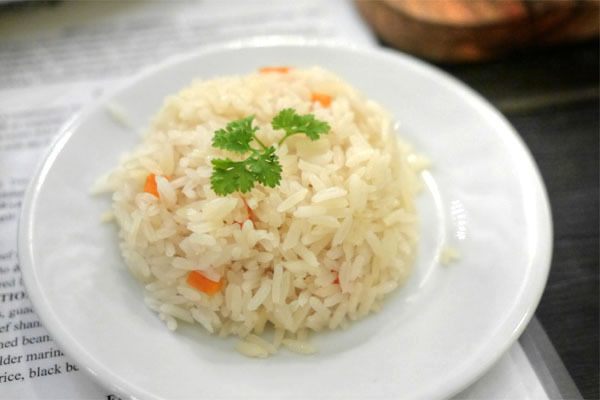 The shrimp came with rice on the side, an apropos accompaniment that was actually quite enjoyable even by itself. Our second mezcal drink was a bit more subtle, with a plethora of zesty ginger notes counteracting the potency of the booze. 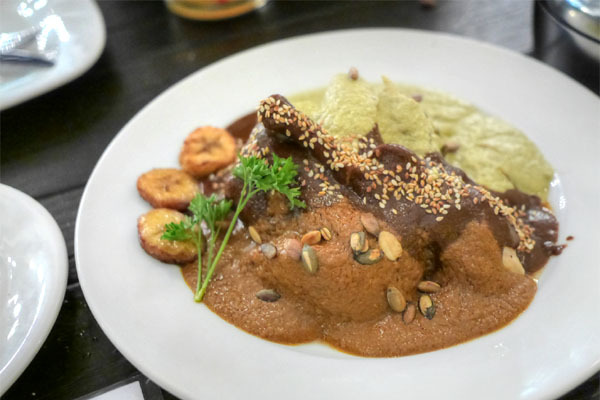 La Casita is of course well-known for its mole, and indeed, the three varieties here made a strong showing for themselves. The Verde was the lightest of the trio, a nutty, creamy sauce that conveyed a subtle brightness from what I believe was tomatillo. The Rojo, meanwhile, was deeper, earthier, with a palpable smokiness to it. 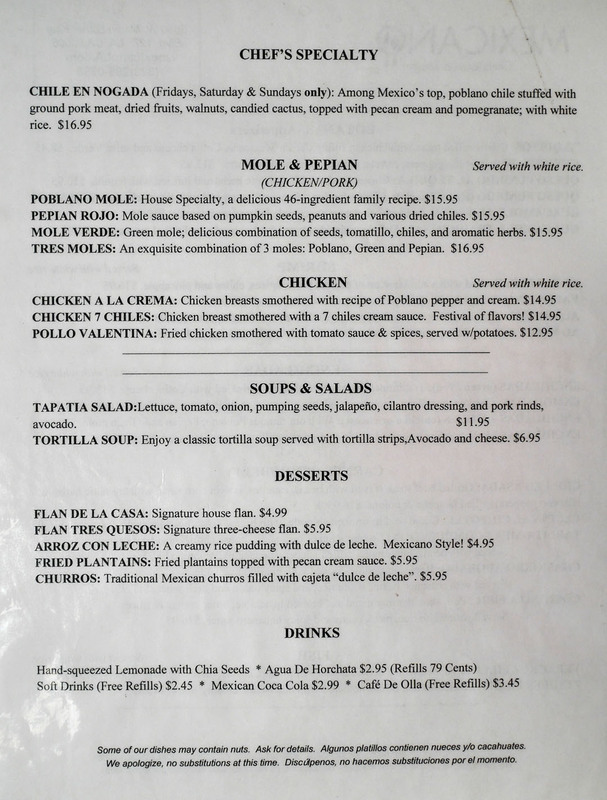 And of course, you have the classic Poblano, made here with a reported 46 ingredients and certainly the most multifaceted of the bunch, its disparate notes of sweet, savor, spice, and smoke all coming together beautifully. My only concern was that the actual chicken came out on the dry side. We ended our savoriness with a tasty fish dish. The actual pescado arrived tender and slightly flaky, a nice level of doneness for our purposes here. 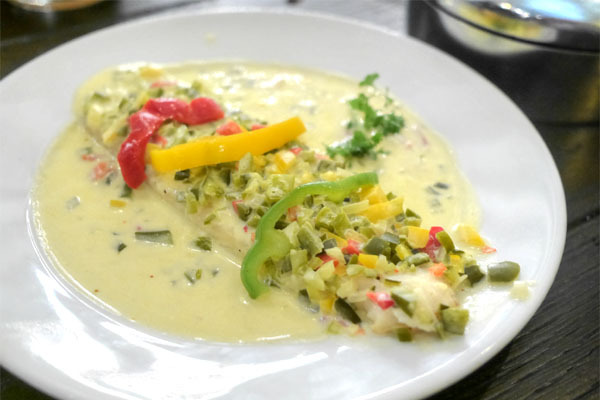 The crux though was the seven-chile sauce, a creamy dressing that presented the piquant nature of the chiles in a restrained, refined manner that didn't overwhelm the fish. Our final cocktail was certainly the booziest of the set, a viscous drink that played spicy, citrusy, and sweet against the potency of the reposado. 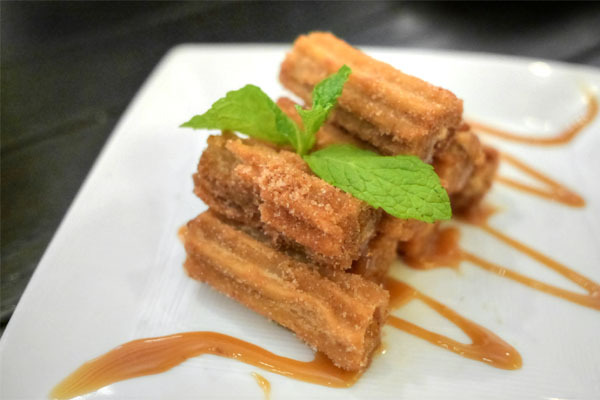 Churros [$5.95] | Traditional Mexican churros filled with cajeta "dulce de leche"
Time for dessert. We had to get the churros, natch. They were just what you'd want, coming out all sugary and caramel-y, creamy on the inside but with a satisfying crispness too. 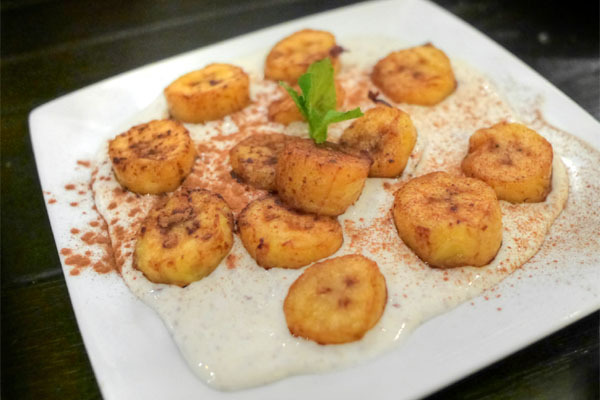 Plantains were comparatively subdued in their sweetness, and I wasn't sure about the accompanying sauce. I wanted more brightness, more acidity, more of something here. Next was an off-menu dessert that's typically served on Good Friday (which was the day following our dinner). 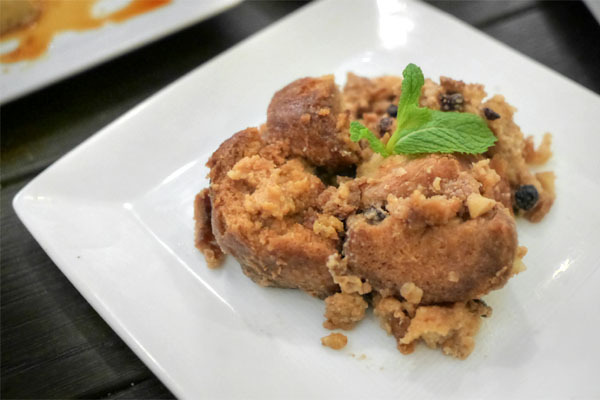 It was a bread pudding of sorts, a sugary and spicy one with some distinct savory and nutty notes. 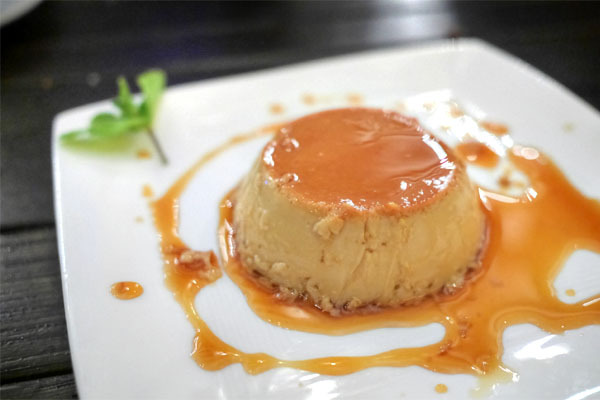 Last up was the flan, a textbook preparation that was dense and eggy, with a lovely sugary component from the dulce de leche. Yum. After waiting all this time, it was great to see Mexicano finally open. 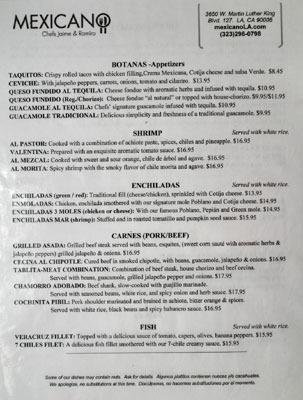 The food looks to be fairly comparable to what you'd get at La Casita, though there's certainly a wider selection of dishes here. Add to that a much expanded beverage program and some comfy environs, and it's a pretty nice place to be overall. Talking with the GM here though, I get the sense that the people around these parts aren't quite used to Mexican fare like this. 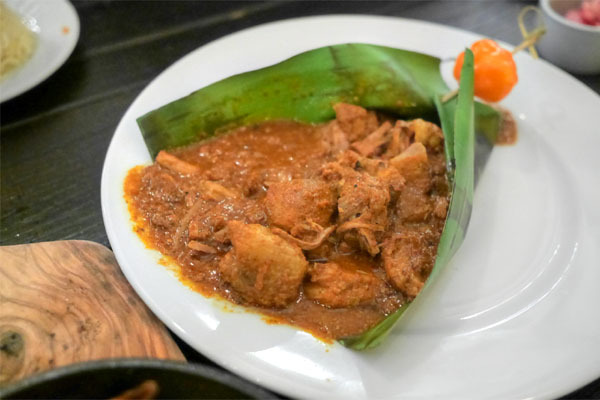 Mole in particular was singled out as being viewed as too exotic. This sounds like the type of pushback that plagued LCM back in the day, so hopefully the Chefs will be able to work through it just like they did in Bell.